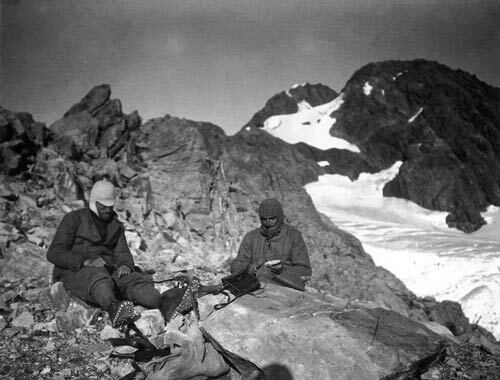 Jim Dennistoun photographed fellow climbers Jack Clarke and Lawrence Earle on the slopes of Mt D’Archiac in March 1910. The previous day Dennistoun had convinced his reluctant companions to carry on to become the first to reach the summit. Arriving late in the day, they spent a very cold night on these rocky slopes above the North Forbes Glacier.